Fair Business Loans are delighted and proud to announce that our parent company, Fair Finance, recently won a much-coveted award at the national 'Citi Microentrepreneurship Awards'. This national awards programme, delivered by the Community Development Finance Association (CDFA) with Citi Foundation, is designed to celebrate the innovative and invaluable work of community finance in supporting financial inclusion and economic growth. Fair Finance picked up the CDFI Growth Award - and a £15,000 cash prize - in recognition of the entrepreneurial flair and passion of the Fair Finance team, and their commitment to transforming the finances and lives of thousands of customers. Of particular note is the way it has grown its range of services, attracted investment and helped more financially excluded customers access affordable loans - both personal loans and new business loans. Fair Finance has helped around 10,000 people access finance in the last 3 years. It is estimated that in the last year alone it has saved clients around £10m in interest payments. The Citi Microentrepreneurship Awards programme spans more than 30 countries and was launched in the UK in 2013. It highlights the contributions of microentrepreneurs and microfinance institutions (MFIs) to their local economies and has invested more than $12 million in microfinance networks and MFIs to convene thousands of key stakeholders that influence sector-wide policy and regulation and encourage innovation around the world. 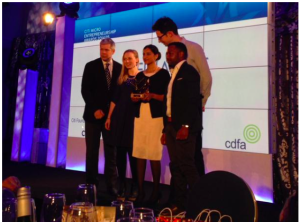 Pictured below are the Fair Finance team receiving their award, presented by the BBC’s Justin Webb. From left to right Eleanor McGill, Soomaiya Syeda, Guillaume Foucaud and Patrick Fernandes. The awards ceremony took place at the Grand Connaught Rooms in London on 4th March. “While Fair Finance has grown in both geographic scale and in products over the last 5 years, we are proud that our most important growth metrics have been sustainability and impact. We are now moving into profitability and proving the CDFI business model is viable to social and commercial partners. Doing this while increasing our social impact is the reason we do this and vindicates our, and the movements, approach. If you would like to know more about Fair Finance - and particularly Fair Business Loans - take a browse through our website, or get in touch with us direct. Be part of our journey through this coming year and you will never look back!